Moviegoers are revisiting the charming and enigmatic Jacqueline Kennedy in the new film, Jackie. Natalie Portman‘s portrayal moved us to share this powerful 1963 article from the Post, where Jimmy Breslin captures the first lady in a Dallas emergency room moments after President Kennedy was assassinated. Moviegoers are revisiting the charming and enigmatic Jacqueline Kennedy in the new film Jackie, starring Natalie Portman as the legendary first lady. The film focuses on Kennedy’s life during the aftermath of the assassination of her husband, and Portman portrays a widow not only stricken with grief, but also concerned for her late husband’s legacy. Jackie Kennedy’s elegance and sophistication created an enduring icon of the ’60s woman, and her quiet, dignified response to tragedy tended a mourning nation. The Saturday Evening Post covered Jackie as first lady — from her solo travels in India and Pakistan to her reinvigoration of White House décor — but few reports captured her with such intimacy and gravity as Pulitzer Prize-winner Jimmy Breslin’s account “A Death in Emergency Room No. One,” published in the December 14, 1963, issue of the Post. [Perry] noticed the tall, dark-haired girl in the pink suit that had her husband’s blood all over the front of the skirt. She was standing out of the way, over against the gray tile wall. Her face was tearless and it was set, and it was to stay that way because Jacqueline Kennedy, with a terrible discipline, was not going to take her eyes from her husband’s face. Father Oscar Huber then entered the room to perform the last sacrament. Jacqueline Kennedy kept praying aloud with him. Her voice did not waver. She did not cry. From the moment the bullets hit her husband and he went down onto his face in the back of the car on the street in Dallas, there was something about this woman that everybody who saw her keeps talking about. She was in shock. But somewhere, down under that shock some place, she seemed to know that there is a way to act when the President of the United States has been assassinated. She was going to act that way, and the fact that the President was her husband only seemed to make it more important that she stand and look at him and not cry. The first lady displayed what many would consider to be unprecedented fortitude in the wake of national and personal tragedy. Moreover, Jackie received more scrutiny from the press than was afforded to previous first ladies. Her retreat from discussions of policy and governance contrasts significantly with the outspoken campaigns of Nancy Reagan, Hillary Clinton, and Michelle Obama. 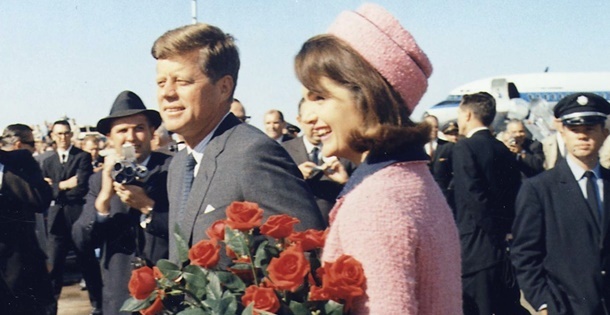 It could be the mystery behind Jackie’s reserve that holds the attention of a nation more than 50 years after her husband’s death. He Walked Past the Girl in Pink and Took on the Hopeless Job. The call bothered Malcolm Perry. “Dr. Tom Shires, STAT,” the girl’s voice said over the loudspeaker in the doctor’s cafeteria at Parkland Memorial Hospital. The “STAT” meant emergency. Nobody ever called Tom Shires, the hospital’s chief resident in surgery, for an emergency. And Shires, Perry’s superior, was out of town for the day. Malcolm Perry looked at the salmon croquettes on the plate in front of him. Then he put down his fork and went over to a telephone. “This is Doctor Perry taking Doctor Shires’s place,” he said. Perry hung up and walked quickly out of the cafeteria and down a flight of stairs and pushed through a brown door, and a nurse pointed to emergency room No. 1 and Doctor Perry walked into it. The room is narrow and has gray-tiled walls and a cream-colored ceiling. In the middle of it, on an aluminum hospital cart, the President of the United States had been placed on his back and he was dying while a huge lamp glared in his face. John Kennedy already had been stripped of his jacket, shirt and T-shirt, and a staff doctor was starting to place an endotracheal tube down the throat. Oxygen would be forced down the tube. Breathing was the first thing to attack. The President was not breathing. Malcolm Perry unbuttoned his dark blue glen-plaid jacket and threw it onto the floor. He held out his hands while the nurse helped him put on gloves. The President, Perry thought. He’s bigger than I thought he was. He noticed the tall, dark-haired girl in the pink suit that had her husband’s blood all over the front of the skirt. She was standing out of the way, over against the gray tile wall. Her face was tearless and it was set, and it was to stay that way because Jacqueline Kennedy, with a terrible discipline, was not going to take her eyes from her husband’s face. Then Malcolm Perry stepped up to the aluminum hospital cart and he took charge of the hopeless job of trying to keep the 35th President of the United States from death. And now, the enormousness of what had happened to John Kennedy came over him. The chest was not moving. And there was no apparent heartbeat inside it. The wound in the throat was small and neat. Blood was running out of it. It was running out too fast. The occipitoparietal, which is a part of the back of the head, had a huge flap. The damage a rifle bullet does as it comes out of a person’s body is unbelievable. Bleeding from the head wound covered the floor. There was a mediastinal wound in connection with the bullet hole in the throat. This means air and blood were being packed together in the chest. Perry called for a scalpel. He was going to start a tracheotomy, which is opening the throat and inserting a tube into the windpipe. The incision had to be made below the small bullet wound. “Get me Doctors Clark, McClelland and Baxter right away,” he said. The tube was to be inserted so it could suction out the blood and air packed in the chest and prevent the lung from collapsing. A transfusion was begun, with O-negative type blood. These things he was doing took only small minutes, and other doctors and nurses were in the room and talking and moving, but Perry does not remember them. He saw only the throat and chest, shining under the huge lamp, and when he would look up or move his eyes between motions, he would see this pink suit and the terribly disciplined face standing over against the gray tile wall. Just as he finished the tracheotomy, Malcolm Perry looked up and Dr. Kemp Clark, chief neurosurgeon in residency at Parkland, came in through the door. Clark was looking at the President of the United States. Then he looked at Malcolm Perry and the look told Malcolm Perry something he already knew. There was no way to save the patient. Just the lips moved. “No,” Jacqueline Kennedy said. Now Malcolm Perry’s long fingers ran over the chest under him and he tried to get a heartbeat, and even the suggestion of breathing, and there was nothing. There was only the still body, pale white in the light, and it kept bleeding, and now Malcolm Perry started to call for things and move his hands quickly because it all was running out. He began to massage the chest. He had to do something to stimulate the heart. There was not time to open the chest and take the heart in his hands, so he had to massage on the surface. The aluminum cart was high. It was too high. Perry was up on his toes so he could have leverage. “Will somebody please get me a stool.” he said. One was placed under him. He sat on it, and for ten minutes he massaged the chest. Over in one corner of the room Dr. Kemp Clark kept watching an electrocardiogram for some sign that the massaging was creating action in the President’s heart. There was none. Doctor Clark sadly turned his head away from the electrocardiogram. “It’s too late, Mac,” he said to Malcolm Perry. The long fingers stopped massaging and they were lifted from the white chest. Perry got off the stool and stepped back. Dr. M. T. Jenkins, who had been working the oxygen flow, reached down from the head of the aluminum cart. He took the edges of a white sheet in his hands. He pulled the sheet up over the face of John Fitzgerald Kennedy. The IBM clock on the wall of the room said it was one P.M. The date was November 22, 1963. Three policemen were moving down the hall outside emergency room No. 1 now, and they were calling to everybody to get out of the way. But this was not needed, because everybody stepped out of the way automatically when they saw the priest who was behind the police. He was the Rev. Oscar Huber, a small, 70-year-old man. He was walking quickly. Malcom Perry turned to leave the room as Father Huber came in. Perry remembers seeing the priest go by him. And he remembers his eyes seeing that pink suit and that terribly disciplined face for the last time as he walked out of emergency room No. 1 and slumped into a chair out in the hall. Father Huber pulled the white sheet down so he could anoint the forehead of John Fitzgerald Kennedy. Jacqueline Kennedy was standing beside the priest, her head bowed, her hands clasped across the front of the pink suit that was stained with blood which came from her husband’s head. Now this old priest held up his right hand and he began the chant that Roman Catholic priests have said over their dead for centuries. “Eternal rest, grant unto him, O Lord,” Father Huber said. “And let perpetual light shine upon him,” Jacqueline Kennedy answered. She did not cry. Father Huber prayed like this for 15 minutes. And for 15 minutes Jacqueline Kennedy kept praying aloud with him. Her voice did not waver. She did not cry. From the moment the bullets hit her husband and he went down onto his face in the back of the car on the street in Dallas, there was something about this woman that everybody who saw her keeps talking about. She was in shock. But somewhere, down under that shock some place, she seemed to know that there is a way to act when the President of the United States has been assassinated. She was going to act that way, and the fact that the President was her husband only seemed to make it more important that she stand and look at him and not cry. When he was finished praying, Father Huber turned and took her hand. “I am shocked,” he said. “Thank you for taking care of the President,” Jacqueline Kennedy said. Then he left. He had been eating lunch it his rectory at Holy Trinity Church when he heard the news. He had an assistant drive him to the hospital immediately. After that, everything happened quickly and he did not feel anything until later. He sat behind his desk in the rectory, and the magnitude of what had happened came over him. “I’ve been a priest for thirty-two years,” Father Huber said. Then Father Huber showed you to the door. He was going to say prayers. It came the same way to Malcolm Perry. When the day was through, he drove to his home in the Walnut Hill section. When he walked into the house, his daughter, Jolene, six and a half, ran up to him. She had some of her papers from school in her hand. “Look what I did today in school, daddy,” she said. She made her father sit down in a chair and look at her schoolwork. The papers were covered with block letters and numbers. Perry looked at them. He thought they were good. He said so, and his daughter chattered happily. Malcolm, his three-year-old son, ran into the room after him, and Perry started to reach out to the little boy. Then it hit him. He dropped the papers with the block letters and numbers and he did not notice his son. Tired is the only way one felt in Dallas the next day too. Tired and confused and wondering why it was that everything looked so different. This was a bright Texas day with a snap to the air, and there were many cars on the streets, and people on the sidewalks. But everything in this town seemed unreal. At 10 A.M. we dodged cars and went out and stood in the middle lane of Elm Street, just before the second street light; right where the road goes down and, 20 yards farther, starts to turn to go under the overpass. It was right at this spot, right where this long crack ran through the gray Texas asphalt, that the bullets reached President Kennedy’s car. Right up the little hill, and towering over you, was the building. Once it was dull red brick. But that was a long time ago when it housed the Deere Plow Co. It has been sandblasted since, and now the bricks are a light rust color. The windows on the first three floors are covered by closed Venetian blinds, but the windows on the other floors are bare. Bare and dust-streaked and high. Factory-window high. The ugly kind of factory window. Particularly at the corner window on the sixth floor, the one where this Oswald and his scrambled egg of a mind stood with the rifle so he could kill the President. You stood and memorized the spot. It is just another roadway in a big, Texas city, but now it joins Ford’s Theater in the history of this nation. R. L. THORNTON FREEWAY. KEEP RIGHT, the sign said. STEMMONS FREEWAY. KEEP RIGHT, another sign said. You went back between the cars and stood on a small grassy hill which overlooks the road. A red convertible turned onto Elm Street and went down the hill. It went past the spot with the crack in the asphalt and then, with every foot, you could see that it was getting out of range of the sixth-floor window of the building behind you. A couple of yards. That’s all John Kennedy needed on this road. But he did not get them. So when a little bit after one o’clock that bitter Friday afternoon the phone rang in the Oneal Funeral Home, 3206 Oak Lawn, Vernon B. Oneal answered. The voice went off the phone. Oneal called for Ray Gleason, his bookkeeper, and a workman to help him take a solid bronze casket out of the place and load it onto a hearse. It was for President John Fitzgerald Kennedy. Saturday, Oneal left his shop early. He said he was too tired to work. Malcolm Perry was at the hospital. He had on a blue suit and a dark blue-striped tie and he sat in a big conference room and looked out the window. He is a tall, reddish-haired, 34-year-old, who understands that everything he saw or heard is a part of history and he is trying to get down, for the record, everything he knows about the death of the 35th President of the United States. “I never saw a President before,” Dr. Malcolm Perry said. © 1963. New York Herald Tribune, Inc.
We didn’t need to read Carol Gordon’s biased opinion of what will happen after January 20, 2017. I didn’t care for President Kennedy, but I respected him and waited to see what he could do for the country while he was in office. Carol needs to do the same for the new President Elect. We can never be united so long as politics stand in the way. Forget Democrats and Republicans and remember that we are citizens of the great country of America. Be proud and pray for the leaders. The memories of that day are burned into my memory forever as it is for so many who experienced that day. I was only 12. I was boarding my school bus when I heard. When I got home, the tv was on and my mother was bent over sobbing. I didn’t have to ask why. I knew. John Kennedy was Sir Lancelot, come to take us out of the darkness of segregation and to the moon and so many other positive things we could only imagine. He was the face of hope. The Bay of Pigs was forgotten. Who cared? As long as our knight in shining armor was leading this country in the direction of inclusion and all that we saw as right. Those shots not only killed President Kennedy. It shot a hole into the bright future of America and we have been hemorrhaging ever since. And here we are, after all this time, with a President elect and congress and senate, with no checks and balances, poised to strip all that America has fought so hard to make fair and right. The fear I felt as a 12 year old, not really old enough to understand the full scope of the tragedy, but I felt the fear, I feel again. This time it is different in the sense that I worry that after January 20, 2017, we will wake up to an America that is unrecognizable, that Democracy will be dead and will have a new face, or no face at all. Sort of like Kennedy. I pray I am wrong.